This Spring Lake Reading quilt mural was painted recently in the school's library.Hopefully this mural will work well with lessons in visual design techniques, world cultures blending together, and the unique history of South Omaha. This painting, done by Richard Harrison and Rebecca Van Ornam of A Midsummer's Mural, was done on canvas and installed with wallpaper paste. Rebecca and Richard have been painting murals about the different immigrant groups that have come through South Omaha for 2 years. They painted a Czech mural and a Lithuanian Mural and will soon be painting unique murals about groups who immigrated from Mexico, Guatemala, El Salvador, and Puerto Rico around the Plaza De La Raza, in South Omaha. After that they hope to paint murals about the Polish and the Irish and many other immigrant groups. For more information about those murals visit Southomahamuralproject.com. For information about the artists visit amidsummersmural.com. Franklin Invaded by Baby Otter! 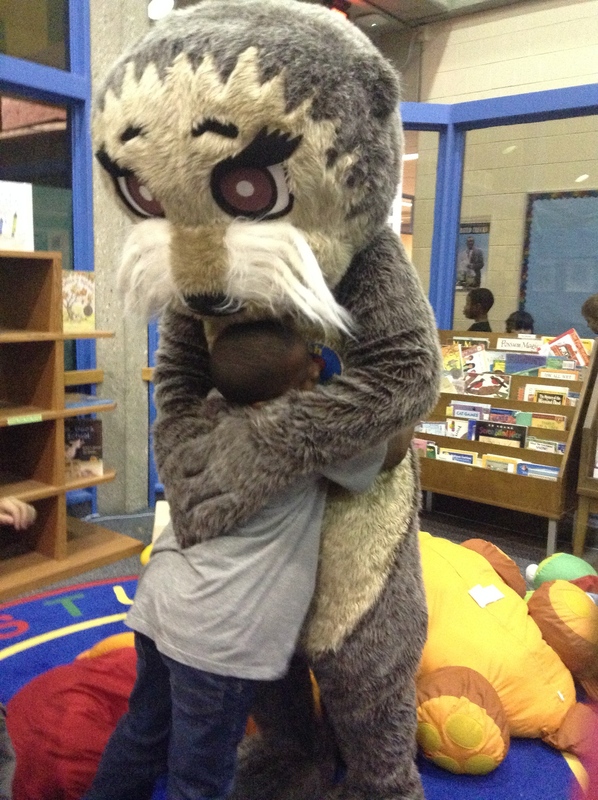 Franklin Elementary Kindergarten students got a visit from Josh the Baby Otter Monday morning. In addition to learning about water safety through story time and a fun song, each student received a copy of the book Josh the Baby Otter, a sticker, and a chance to high five Josh. As you can see, many of them opted for a high five and a hug. This free presentation was from the City of Omaha was a huge hit with our Kindergarten students and teachers alike. We know exactly how awesome our school librarians truly are--and this article is a great reflection on the power of the school librarian. Excerpt: This is simply something we shouldn’t forget about in the great hub bub of discussion over education. Hold tight to the public school library, please, for all students. Let’s remember the library’s awesomeness, its power, the fact that it delivers a confidence in education, and the librarian’s role in connecting reading to writing, class lessons to research, socialization, and independence. Happy Holidays from your TAC Library Services Team!